I know it's been so long since I haven't reviewed anything so here I am with my views on this gorgeous looking palette which was sent by just4girls for my review. So when I received this palette my reaction was OMG! This is so gorgeous. This smokey palette is quite different than the other eyeshadow palettes of BH cosmetics. So as you can see the pigmentation is quite good when I swatched it on my hands I felt that it's really BOMB & the shadows gave me a leathery feeling which again as compared to the price is awesome. But what turned me off was when I used it on my eyes the fallout was really bad like really really too much for me. I turned into a raccoon when I tried blending but yeah if you work with ur fingers it isn't that bad. So long story short I kinda like this palette & yes I would definitely recommend it to you guys. 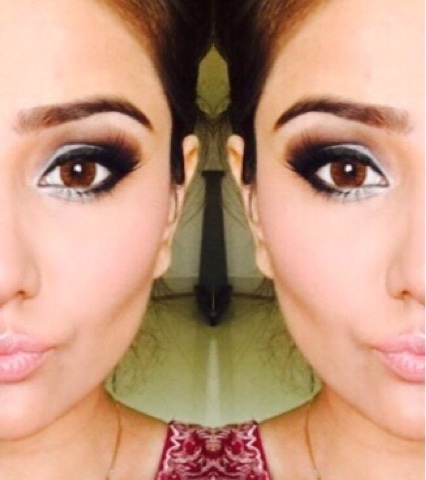 Here is a look which I created by using this eyeshadow palette hope you guys like it. Have you tried this palette or anything by Bh cosmetics? That killer smokey eye look! <3 The palette seems great pigmentation wise and perhaps that's why you experienced so much fallout! Love the look you've created. And the palette has the perfect shades for smokey eyes. What a great range of colours and lovely pigment. I love the look you've created too.